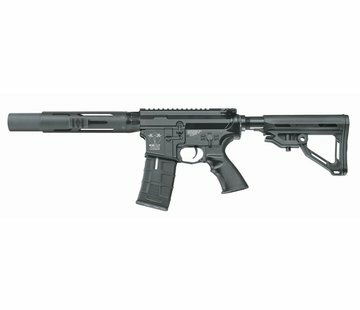 ICS CXP-HOG Tubular SR (Black). CXP-HOG, the newly short barrel designed look with modern style. “Hog” is a symbol of strong explosion. Aggressive geometric surfaces enhance the unique new style. Strong and powerful lines demonstrate this dynamic personality. 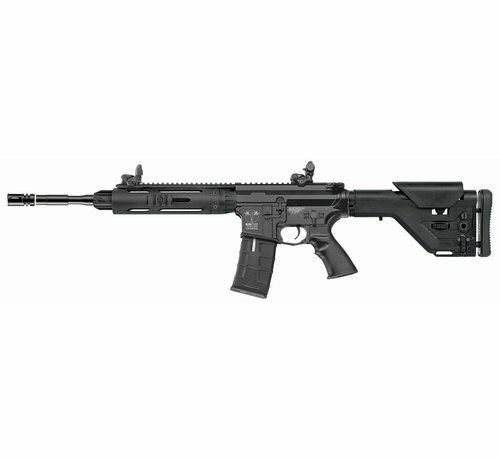 The CNC machined one piece upper receiver empowers the fighting spirit. CXP-HOG utilizes an all new rear wired gearbox. This incorporates a brand new hidden wire design within the stock tube. It is easy to replace batteries by removing the rear stock. The new hidden wire system keeps the wires protected from damage and allows the gun to look more realistic.